(2004/MAGIC) 24 tracks 1949-1974 - 24 Bit mastering Digipack with 8 page booklet Rock 'N' Roll Jubilee by Jacques Barsamian & Martial Matinay 50th Anniversary Original versions restored & remastered include booklet with french & english sleeves notes. 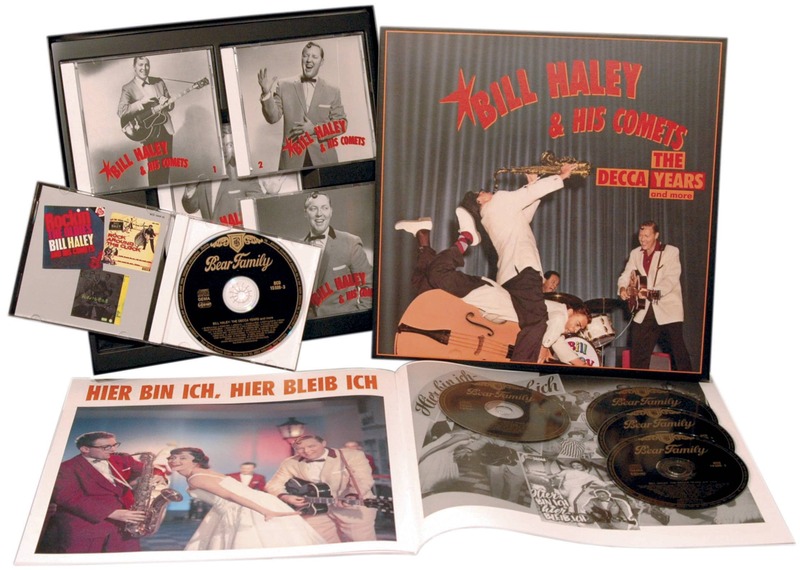 "Bill Haley & His Comets"
The hoopla surrounding the purported fiftieth anniversary of Rock 'n' Roll 2004 didn't quite ring true. 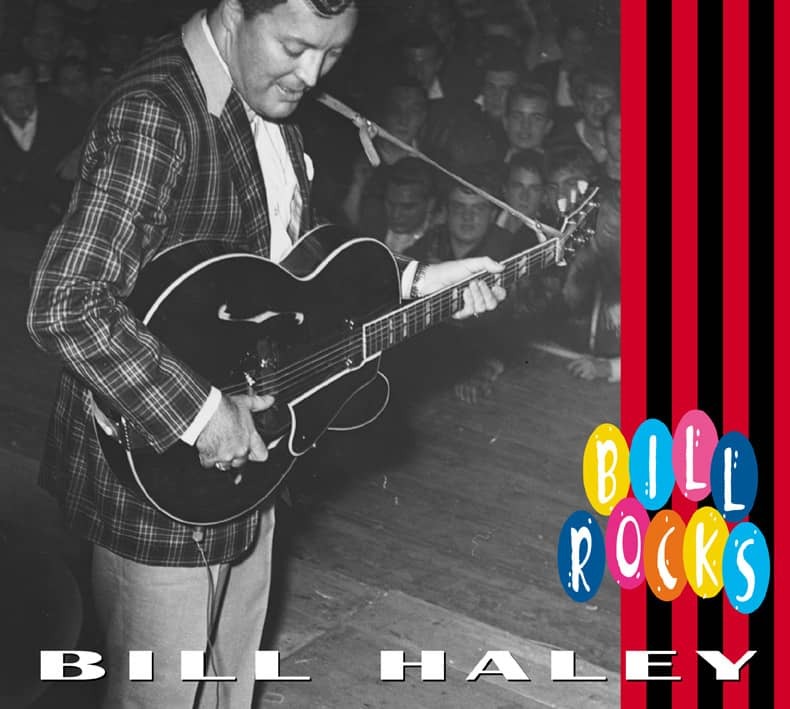 Bill Haley might have lobbied for 2001...fifty years after he'd covered Rocket '88'; or 2002…fifty years after he'd recorded Rock The Joint; or 2003...fifty years after he broke into the pop charts with Crazy, Man, Crazy, a record that fit every criterion of rock 'n' roll. But, of course, Bill Haley said not a word; he had died neglected and alone on the Mexican border in 1981, and even at the time of his death he was wondering why he'd been written out of the story. True, the Pennsylvania polka bars and union halls where Bill Haley stumbled upon his music didn't have the eye candy appeal of Memphis after dark, and true, kids didn't want to be Bill Haley as they wanted to be Elvis Presley, but he was absolutely, definitively first. Perhaps the only ingredient of rock 'n' roll (as we would come know it) that's missing from these recordings is the music's democratic ideal. You could buy a guitar and with a little aptitude and a few weeks' patient study you could pick out a Duane Eddy tune or an Elvis solo, but you would not be able to play much of the music on this collection. The basic truth about rock 'n' roll has been reiterated in thousands of books, documentaries, and articles. It was the fusion of R&B, country, and pop, but while Elvis talked about seeing the very primitive Arthur Crudup, Bill Haley's idea of R&B was the tightly marshaled swing of Louis Jordan and the showmanship of the Treniers. While Elvis thought of Hank Williams and Bill Monroe as country, Bill Haley thought of the Sons of the Pioneers. It was a difference that resolved itself to age and geography. Elvis was ten years younger than Bill Haley, and he came from the South, while Haley grew up on the east coast. Make no mistake, though, Bill Haley paved the way for Elvis. When RCA Victor in New York signed Elvis away from Sun Records, they were hoping they'd signed someone who could reach the market that Haley had opened up: a market that no one knew existed before Haley. The full story of Bill Haley's early years is told in Chris Gardner's extended biography. 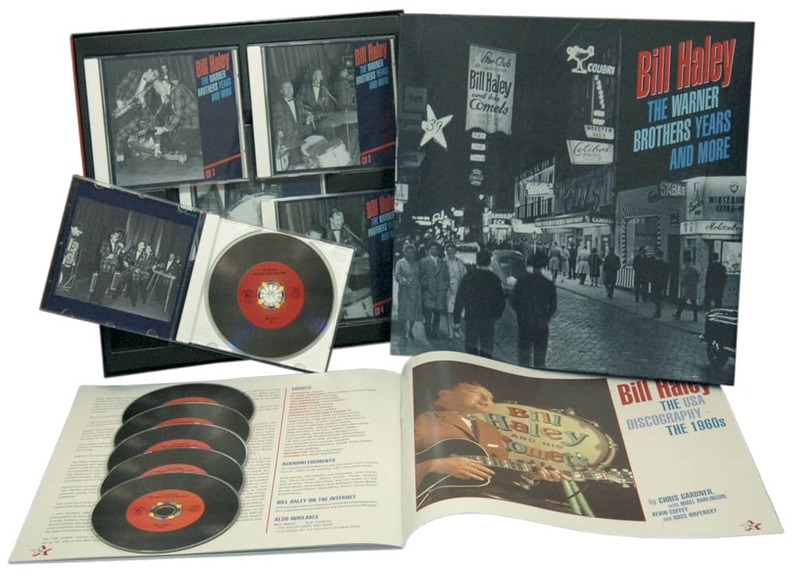 Included with our definitive collection of early Bill Haley, 'The Real Birth Of Rock 'n' Roll' (BCD 16509). Briefly, William John Clifton Haley was born on July 6, 1925 in the Detroit suburb of Highland Park. His father, Bill Sr., was a transplanted Kentuckian and his mother, Maude, was British. Bill Sr. moved the family to Boothwyn, Pennsylvania during the Depression and kept his head above water by working in the shipyards. He played the banjo and Maude played light classics on the piano. Bill Jr.'s desire to play music was inhibited only by the shyness that probably stemmed from self consciousness over his one blind eye. Before the end of the Second World War, though, Bill Haley was trying to carve out a career in music. He was very much in the thrall of pre-War faux cowboy music. He wore the hat, sang the songs of an idealized west, and yodeled. In fact, he told Canadian dee-jay Red Robinson that he was an Indiana state yodeling champion, although no one has ever been able to confirm (or deny) that claim. There were rumors that he'd made his first recordings with the Downhomers in 1945, but that seems unlikely. By the end of 1947, Haley was back in eastern Pennsylvania after stints throughout the northeast, and made what were probably his first recordings for Jack Howard's Arcade Records with his group, the Four Aces of Western Swing. He had a spot on WPWA in Chester, Pennsylvania, and formed a partnership with two future Comets, steel guitarist Billy Williamson and accordionist Johnny Grande. He'd also signed away parts of his income, apparently in perpetuity, thereby setting the stage for the financial problems that would dog him to the grave…and beyond. In 1948, though, a percentage of Haley's income didn't amount to much. "I was working until 2:00am in the clubs and opening the station [WPWA] at 6:00am," he recalled to the 'Philadelphia Sunday Bulletin'. "Seven days a week!" In 1949, Haley changed the name of his group to the Saddlemen (to avoid conflict with another popular local group, the Four Aces) and moved them through a number of brief label affiliations, including a fling with Atlantic Records via a lease deal. In 1951, Haley signed with Dave Miller, an engaging if morally ambiguous man. Who at least knew how to get records distributed outside eastern Pennsylvania. (one of his labels, Palda, issued records by the other Four Aces). Miller later found his niche as one of the godfathers of the budget record business. At one time, was responsible for more records cluttering up thrift stores and charity shops than anyone else—even Andy Williams. Now we fast-forward to 1952. R&B bandleader Jimmy Preston, who was from Haley's adopted hometown, Chester, cut the frantic Rock The Joint as a Good Rockin' Tonight spinoff in 1949. An R&B dee-jay in Chester used Preston's record as his themesong, so Haley undoubtedly knew it well. "Out on the job one night, just kidding the band," Haley told 'TV Radio Mirror' in 1957, "I went into 'Rock The Joint.' Billy (Williamson) and Johnny (Grande) started to laugh and joined in. Al Rex hit it on the bass. We really got a kick out of it ourselves. Then I looked around -and, so help me- people were dancing. I turned to the guys and said, 'What on earth did I do?" The guitar solo was by Danny Cedrone, leader of another local group, the Esquire Boys. It doesn't take a degree in musicology to figure out that it's the same solo that Cedrone would replicate almost note-for-note on Rock Around The Clock two years later. It was a fiendishly difficult solo, and the first great rock 'n' roll guitar setpiece. Haley, incidentally, wrote Rock-A-Beatin' Boogie for Cedrone's Esquire Boys. Parenthetically, it's worth noting that Haley's record wasn't the first white cover version of Rock The Joint; that honor goes to the sadly neglected Jimmy Cavallo, who, in 1951, cut a version modeled closely on Preston's. Haley seemed reluctant to commit himself to this new music. Preferring the economic certainties of the east coast country music dances. But he slowly began to realize that he'd seen the future…and it rocked. 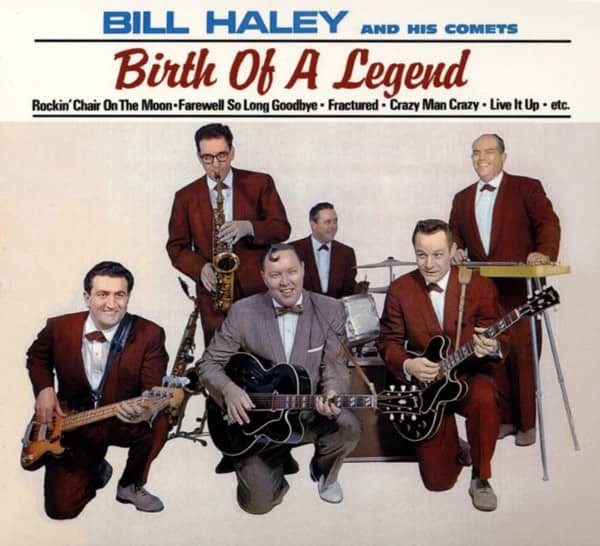 At the suggestion of Bix Reichner (who hosted a jazz show on WPWA and later wrote songs for Haley), the Saddlemen became the Comets, and the first single under the new name was Real Rock Drive. Although credited as the composer, Haley had in fact rewritten Tani Allen and Buck Turner's Bullet recording of Tennessee Jive. Bullet's publishing company, Volunteer Music, sued right away, despite Turner's advice that they should wait to see if Haley's disc became a hit. Essex stopped working Haley's record, and promptly issued Crazy Man Crazy.Haley's new manager, 'Lord' Jim Ferguson, persuaded Haley to quit the beer joints in favour of high school gigs. Despite the fact that it meant a drop in earnings. It proved the smartest thing we ever tried, wrote Haley's accordionist, Johnny Grande, in 1957. The kids taught us. We tried our experiments on them. When their shoulders started moving and their feet started tapping and their hands clapping. We knew that a certain tune was worth keeping in the act....Bill noticed that their favorite expression was 'Crazy!'. He took their word and their football chant, 'Go! Go! Go!' and gave it back to them in a song". Crazy Man Crazy entered the Pop Top 10 and the die was cast. Everyone around Haley began to sense that they were onto something – even if no-one knew quite what. Grande described the painstaking process by which Haley had evolved his sound: We rehearsed in the studio every day for two years. One of the engineers gave us a big assist by putting our trial runs on tape. And playing them back so that we could study them. When we were broke he would sort of delay putting it on the bill. Always we were looking for something. We'd take a standard like 'Ida' and we'd play it every way we could think of; - fast, slow, loud, soft, hillbilly, waltz, dixie, progressive. 'Haley was like a scientist putting one thing after another into a test tube,' Billy (Williamson) says. 'And he'd be so happy when one experiment turned out right'. One of the most important experiments happened one day when we were studying some Count Basie records. Since we didn't have brasses, we fooled around with the strings, trying to get the same effect, trying to build volume. Haley with the bass discovered that when he plucked the strings in the accepted way, it came out rrom-pahhh. If he back slapped them, it changed the accent to rrom-pahhh. That's how the heavy back beat became the basic form in our rock & roll." The follow-ups to Crazy Man Crazy showed that Haley still hadn't truly grasped what was happening. At two of the sessions after Crazy Man Crazy, though, he presented a song called Rock Around The Clock. But Dave Miller refused to cut it because of an ongoing dispute with the music publisher and co-writer, James Myers. The song had been written in 1953 by Max C. Freedman, a Philadelphia songwriter, already 60 years old. He'd written Sioux City Sue in 1945, and had worked stints as an announcer and radio personality. Customer evaluation for "Birth Of A Legend...plus"